Diffusion of metabolites and small non-nuclear molecules as well as active, mediated import of protein and export of protein and RNA through the nuclear envelope occurs through nuclear pore complexes or NPC’s. NPC’s contain up to 100 different polypeptides which have a combined mass of about 125 megadaltons. The channel available for passive transport through the NPC is about 9-10 nm in diameter while carrier mediated changes in the NPC result in a ~25 nm channel used for larger, actively transported molecules. The selectivity of nucleocytoplasmic transport rests in parton the structure of the NPCs but additionally depends on a variety of soluble carriers. These carrier proteins are designed to recognize cargo destined for translocation and to shuttleback and forth efficiently through the nuclear pores. Ran is a small signalling GTPase that is involved in nucleocytoplasmic transport. Two additional functions of animal Ran in the formation of spindle asters and the reassembly of the nuclear envelope in mitotic cells have been recently reported. In contrast to Ras or Rho, Ran is not associated with membranes. Instead, the spatial sequestering of its accessory proteins, the Ran GTPase-activating protein RanGAP and the nucleotide exchange factor RCC1, appears to define the local concentration of RanGTP vs. RanGDP involved in signalling. Mammalian RanGAP is bound to the nuclear pore by a mechanism involving the attachment of small ubiquitin-related modifier protein (SUMO, see "Focus on Ubiquitin-like Proteins" ) to its C terminus and the subsequent binding of the SUMOylated domain to the nucleoporin Nup358. Ran binding proteins (RanBPs) belong to a family of proteins that bind Ran GTPase and help to stimulate its GTPase activity. Members of the RanBP family show weak similarity to importin beta, a protein involved in the transport of proteins to the nuclear membrane. Most of the proteins that carry cargo through the NPCs are members of the importin / karyopherin family. Two common features of the karyopherins is their ability to bind to nucleoporins and to form a complex with the GTP-bound state of the Ran GTPase. An important member of this family is Transportin 1. The affinity of transportin1 for Ran-GTP is 10,000-fold higher than that for Ran-GDP, so the switch is very efficient and must entail a conformational change in the transportin1 structure. Transportin1 can also carry ribosomal proteins, such as L23a, into the nucleus, through recognition of a highly basic region of the proteins called the BIB domain. OriGene Technologies offers a panel of antibodies to Ran, Ran regulating proteins and cargo proteins interacting with Ran, which can be used for western blotting and immunocytochemistry / Immunohisto-chemistry. 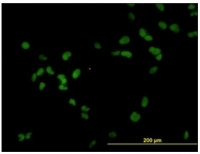 Immunofluorescence of monoclonal antibody to RCC1 on HeLa cell at 10 mg/ml Cat.-No. AM31738PU-N.
Staining of paraffin embedded Human Kidney using RANBP1 Antibody Cat.-No. AP16253PU-N at 3.8 µg/ml. Steamed antigen retrieval with citrate buffer pH 6, AP-staining. Immunohistochemical staining of RanBP2 in bovine retina using Cat.-No. SP5154P. Immunohistochemical staining of RanBP3 in NRK cells using SP5156P.